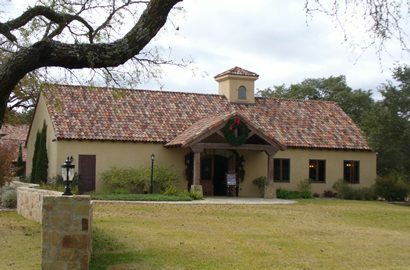 Grape Creek Winery, Fredericksburg Texas. You know what’s fun? Besides listening to Texas Tech football coach Mike Leach speak- fun is drinking a nice, refreshing, Texas wine on a Saturday afternoon while preparing for the coming workweek. Maybe that’s not the waterskiing on Lake Travis fun that you were envisioning. But if we add that you’re drinking this extraordinary glass of wine straight from the stainless steel tank where it’s aging at the winery where the grapes were crushed, then the event becomes significantly more exciting. Fun is having this drink while the winery’s owner explains his methods, his materials, his passions. That is fun as my wife and I might define it, and exactly what we did on a recent Saturday afternoon. Texas, if you have been paying attention, is this country’s fifth largest producer of wine. With 180 plus wineries, choosing a couple to visit can prove slightly more complicated than you may think. Living in Austin can sometimes further cloud the decision since the Hill Country is home to many of the state’s wineries, several of them clustered around highway 290 in the Fredericksburg area. Although, making the choice of which to visit first became much simpler when my wife, a college-educated, classroom teacher and artist chose Grape Creek Vineyards because the wine’s label looked “cute”. Grape Creek Vineyard, approximately 10 miles east of Fredericksburg, rests, like so many of its neighbors, on a beautiful expanse of land that is awe-inspiring even during the slight decay of a late Autumn. The winery’s owner, Brian Heath, and his companion Jennifer Evenson welcomed us as we walked around back of the tasting room. (We discovered later that this area was the official “red” tasting location-the winery being of a size to warrant a second room for the whites and those reds not quite in the meaty, heavy hitter category). Like so many of his colleagues across the country, Mr. Heath came to the wine industry after years in the business world. But, possessing both a predilection for the wine trade and a desire for a new direction, he also came equipped with a pre-penned business proposal when a Hill Country winery came up for sale in 2006. Heath knew, from the outset, what he wanted by purchasing the winery. For himself, at least, there is much more to the wine business than crushing, aging, bottling and selling grape juice; he wanted to create an “experience that’s centered around wine.” From this vision, Heath has managed to produce a sort of wine theme park replete with tasting rooms, wine-related merchandise such as t-shirts, books and snack foods and even a red trolley for carting visitors around the property to inspect the storage tanks, the oak barrels and, of course, the vineyard which literally surrounds the facilities. The effect is one of immersion in the wine culture. As we sat and spoke that Saturday afternoon, I noticed that many people had already discovered the quiet pleasure of an afternoon spent with a fine Texas wine. Each tasting room teemed with small families or couples out for the adventure of the new and, perhaps, the unexpected. I mentioned that the place seemed lively, even crowded. Heath responded with, “We’re usually much busier. This is pretty light.” Evidently, I was the novice in the room; the green grape on a matured vine. Later, Mr. Heath loaded us into his pick-up and we headed out to the storage areas. 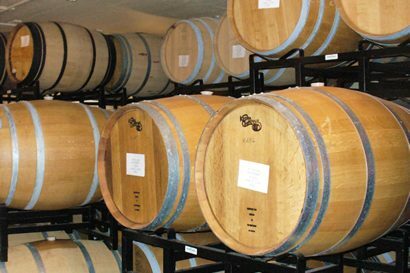 As his website maintains, there is an underground facility that may or may not be the sole subterranean storage room in the whole of Texas wineries. Filled with double layers of French and American oak barrels, much of the vineyard’s red wine was patiently waiting its turn at the bottling machine-some destined for release in a few months, some still needing another year or more. Anticipating production growth, several new casks stood at the ready, plastic-wrapped and waiting for the next vintages of red wines that Grape Creek will produce this next season. Even with twelve constant, annual varietals, Heath is looking to increase the winery’s production. At least one blend will highlight an Italian varietal in keeping with the “Tuscany in Texas” theme. Standing in the chilled warehouse where the vineyard’s white wines are stored and aged, I had the feeling that I was participating in something inherently unique. As Mr. Heath poured out samples of a few different white wines I was impressed by his excitement and enthusiasm for his product, his business. Each cask’s offering brought its own tale of odyssey, risk and accomplishment. Each sip provoked smiles and raised eyebrows all around. However, not every wine was ready for inspection. Of one sampling, a merlot that had only had a few months in the cask, Heath took a sip, declared it “way too young” and with that, slapped the remainder of the liquid into the room’s sink. So, sometime soon, find the time to visit one of our wineries. Find one with a cute label and give yourself plenty of time to explore and enjoy a uniquely Texas product. Trust me- it’ll be fun.